Welcome to our all new community performing arts education center at Spencer. 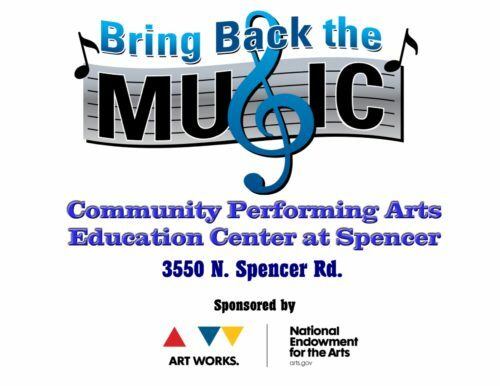 Bring Back The Music is an Oklahoma-based nonprofit, 501(c) (3) corporation, providing youth in need with resources, life skills and opportunities in music education, performance and higher learning. We provide low cost music education programming, workshops, clinics as well as exposure to exciting and culturally enriching field trips and performance opportunities. From concerts, galas & corporate events to recordings, tours and Masters Classes. Students will learn technique, theory and history with the instruments and of their choice. We offer piano, guitar (both electric and acoustic), voice/singing, drums/percussion, bass guitar, upright (double) bass, saxophone, trumpet, music theory, songwriting, composition, and audio production with Logic Pro X. Bring Back The Music’s out-of-school-time programs include a robust offering of after-school and summer courses. All courses are taught by professional artists and offer hands-on instruction in distinctive music, dance and theatre traditions. Programs are designed to promote self-discovery and expression through the arts, artistic skills development, and valuable life skills in critical thinking, problem solving, communication and collaboration. We also offer one-on-one private lessons at low monthly rates. Our teachers are working professional artists with considerable education and professional performance experience. All of Bring Back The Music staff have successfully completed background checks. Bring Back The Music believes every child with a passion for music should have access to an affordable quality music education. BBTM is committed to providing the full range of musical services and instruments to all under-served youth in eastern Oklahoma County.